No Plan, No Capital, No Model...No Problem. Guy Kawasaki moderates a discussion with 5 no-VC-needed startups including our buddy Markus Frind. Great stuff all around. The standout was James Hong of HotorNot.com with his stories of making it happen, not just without VC funding, but without any money of any kind. Guy interviews Jeffrey Kalmikoff of Threadless. Another group of untrained guys who followed their gut and are now a ridiculous success (selling 80-90K tee shirts/month). Seth tells us how to make a million dollars. It's not $1 from a million people (too hard to reach that many) but more like $10K from 100 organizations, push though "the dip" and dominate through excellence. 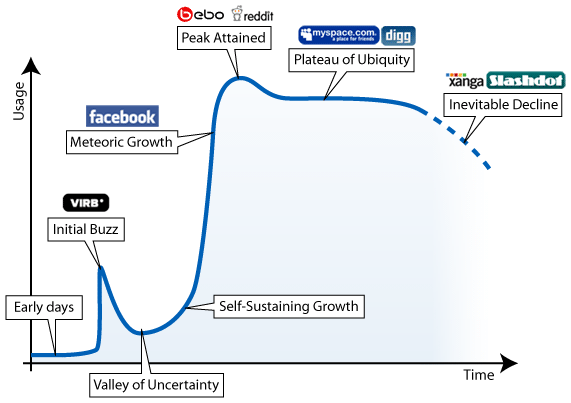 The Ebb and Flow of Social Networking is an insightful little observation for those of you (us) fixing to make hay with the social networking phenomena. (That site distorts the graph, see it clearly here).